This article will walk you through the steps to configure Cisco Adaptive Security Virtual Appliance (ASAv) on VMware Fusion. 1. Sign in to your Cisco account to download the ASAv package. Note: A valid service contract is required for the download. Select the Download Software link. Select the Adaptive Security Appliance (ASA) Software link. Select the version from the menu on the left. For my example, I will be using the 9.6.1 version. Click the Download button for Cisco Adaptive Security Virtual Appliance VMWare Package for the Cisco ASAv Virtual Firewall. Save the asav961.zip file to the Downloads folder. Double-click the asav961.zip file to uncompress (expand) it. 2. 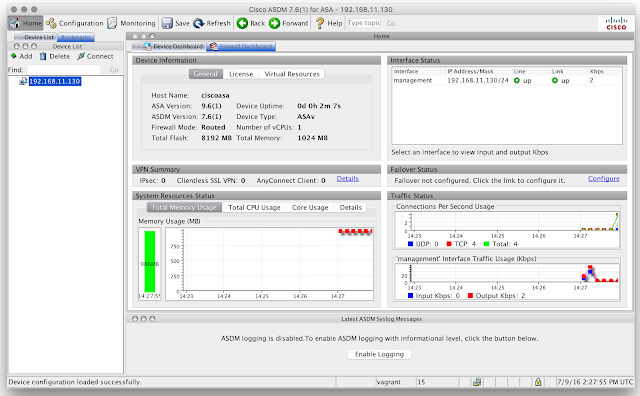 Create the Cisco ASAv base. 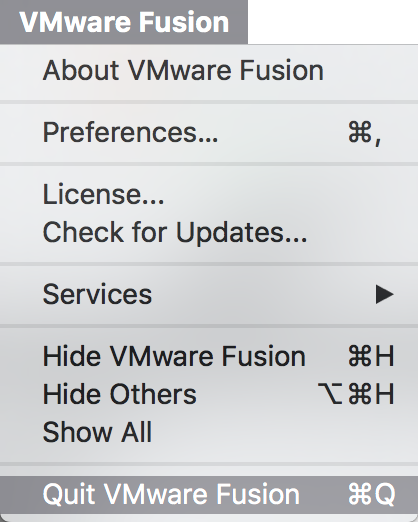 Open the VMware Fusion application. Click File -> Import... from the VMware Fusion menu bar. Click the Choose File... button. Navigate to and select the asav-esxi.ovf file in the asav961 folder. Click the Accept button for the EULA. Click the Customize Settings button to modify the virtual appliance settings. Set Network Adapter to Share with my Mac. Remove Network Adapter 2 to Network Adapter 10. Uncheck Connect CD/DVD Drive for CD/DVD (IDE). Upgrade the VM hardware version to 12 (Compatibility -> Upgrade). Close the VMware Fusion application. 3. Add a custom serial port (for management via console connection). From a terminal, append a serial port device to the virtual appliance configuration file. Verify the component has been added. 4. Start the virtual appliance. 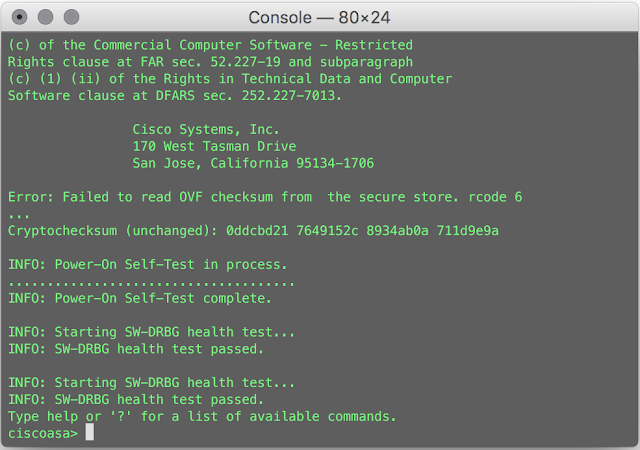 From a terminal, start the virtual appliance with the vmrun command. Note: An automatic reboot will be performed after initialization. 5. Configure a network serial port for the virtual appliance. 6. Initiate a console connection (via Telnet) to the ASAv virtual appliance. 7. Establish a baseline configuration for the Vagrant box. Verify the Cisco Adaptive Security Device Manager (ASDM) software is available. Enable the http server required to run ASDM. Save the running configuration to local NVRAM. 8. Stop the virtual appliance and quit the VMware Fusion application. Stop the virtual appliance from the original terminal window (or tab). 9. Create the Vagrant box. Change the current directory to ASAv-961. 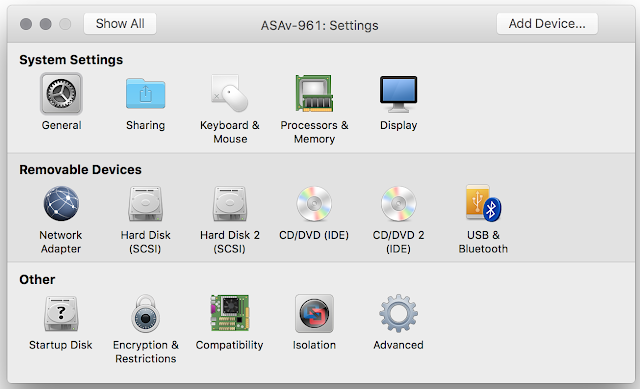 Remove all generated MAC addresses from the ASAv-961 configuration file. Create the metadata.json file for the VMware provider. List the directory contents to verify the essential files are present. Package the Vagrant box file with tar. 10. Add the Vagrant box. Add the Vagrant box to our local inventory. 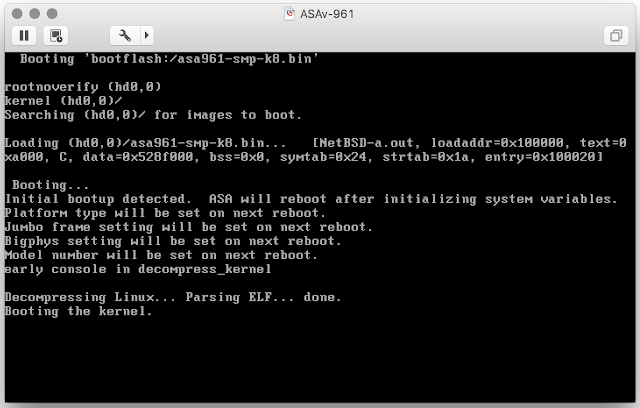 ==> box: Successfully added box 'cisco-asav-961' (v0) for 'vmware_desktop'! Verify the box is now listed. Create a directory for a test project and change to it. Show the current status of the vagrant machine. then the machine is not created for that provider. Timed out while waiting for the machine to boot. This means that Vagrant was unable to communicate with the guest machine within the configured ("config.vm.boot_timeout" value) time period. If you look above, you should be able to see the error(s) that Vagrant had when attempting to connect to the machine. These errors are usually good hints as to what may be wrong. If you're using a custom box, make sure that networking is properly working and you're able to connect to the machine. It is a common problem that networking isn't setup properly in these boxes. Verify that authentication configurations are also setup properly, as well. If the box appears to be booting properly, you may want to increase the timeout ("config.vm.boot_timeout") value. The status of the vagrant machine is now in the running state. The VM is running. To stop this VM, you can run `vagrant halt` to shut it down, or you can run `vagrant suspend` to simply suspend the virtual machine. 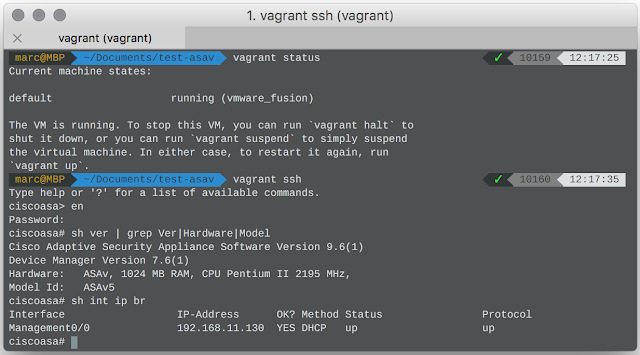 In either case, to restart it again, run `vagrant up`. or with Cisco Adaptive Security Device Manager (ASDM). Stop the vagrant machine with the force option. Destroy (Delete) the vagrant machine with the force option.